The deepest lake in the world is going through hard times due to uncontrolled tourism and the illegal dumping of liquid waste, but the state is taking steps to address the problem. Sweeping almost 400 miles in a great arc through the taiga forest of south-eastern Siberia, Lake Baikal is the world’s oldest and deepest freshwater lake. Surrounded by pristine mountain scenery, thick forest and villages full of picturesque wooden cottages, the deep blue lake is a place of stunning beauty. As such, it is no surprise that the last few years have seen a huge increase in the numbers of tourists from Russia and all over the world, who come to fish, hike, camp and relax along the shores of the ‘pearl of Siberia’. The region’s tourist industry is actively developing, and plans are well underway to open up more of the lake’s shoreline to ecotourism. The Bolshaya Baikalskaya Tropa (Great Baikal Trail) environmental organization is currently building, with the help of volunteers from all over the world, a continuous hiking trail that will stretch all the way around the lake when completed. Yet as Marina Rikhvanova, the co-chair of the Baikalskaya Ekologicheskaya Volna (Baikal Environmental Wave), told RBTH, projects of this kind are useful, but they cannot make a significant contribution to the preservation of the ecology of the lake itself. And while the growth in tourism is undoubtedly good news for the region’s economy, there are fears that it is placing a serious strain on undeveloped local sanitary infrastructure and contributing to water pollution. In fact, Baikal is facing a growing challenge to keep its famously pure waters clean. 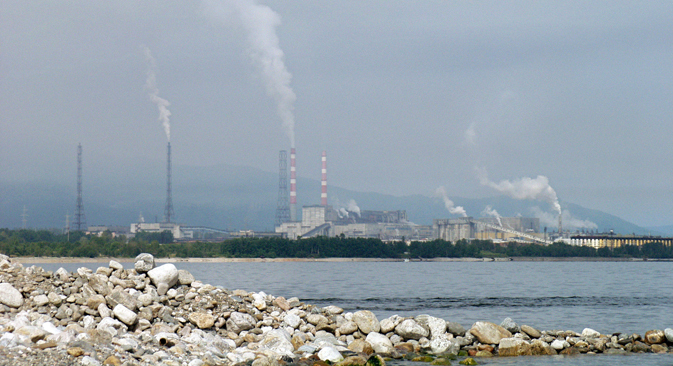 The major industrial polluter of Lake Baikal is the Baikalsk Paper and Pulp Mill (PPM). It was built on the shore of the lake in the 1960s, and as the website of the Russian branch of Greenpeace notes, it was even outdated then. The problem is that the production technology did not allow for the bleached pulp product, which happens to be the main product of the plant, without the intake of Baikal water. Until 2008, the PPM was taking in 200,000 cubic meters of clean water and releasing water that had been used during work back into the lake. When the plant was forced to move to a closed water cycle, production was unprofitable and was stopped. Since PPM was a major employer in the town of Baikalsk, thousands of jobs were placed in jeopardy. The combine stood inoperational throughout 2009, until January 2010, when Russian President Vladimir Putin intervened in its fate and allowed work to resume using the same technology. Water and soil samples in 2011 and 2012 again showed a significant excess of chemical elements in the points of discharge, so the plant was still forced to close and repurpose. Now the main problem for the PPM is the 6 million tons of toxic lignin sludge that has accumulated on the two test sites since the 1960s. Waste did not separate from the external environment, so the groundwater was poisoned. One of the plant’s sites is 300 meters from the lake shore. The risk to Lake Baikal’s ecology is increased when the fact that that the mill is located in a seismic zone is taken into consideration. The disposal of waste produced by the paper mill is outlined in the state program for the coming years. The second cause of water pollution after the PPM is the uncontrolled discharge of liquid waste, the bulk of which is feces from the cesspools of private homes not equipped with a sewage system. “While earlier it was harmless, as the population around Lake Baikal was small, the problem has begun to grow due to the appearance of tourists and the construction of tourist facilities,” said Rikhvanova. There is one place, Chivyrkuisky Bay, where 160 tons of feces wash into the waters during the summer season. This has led to a massive expansion of unusual organisms in Baikal – the green algae Spirogyra and Elodea Canadian. According to Rikhvanova, Baikal has very few treatment plants able to take on large volumes of liquid waste for treatment, so many of them simply dump waste into the lake or tributaries. This problem, she said, can be overcome if all projects announced in the federal program are able to be implemented. As the site of the Environmental Monitoring of Lake Baikal website reports, even the lake’s spa resorts are being polluted, as pathogenic bacteria has been found in the waste water. However, there are now reasons to be optimistic about the future: Lake Baikal has now become a major state environmental project. In addition to an already-existing state law on the protection of Lake Baikal, in August 2012 the large-scale “Protection of Lake Baikal and the Socio-economic Development of the Baikal Nature Reserve for 2012-2020” state target program was adopted. The projects that form part of this program will be funded by the state budget and include some encouraging points. For example, first of all, regulations will be developed to limit pollution levels in towns in the Baikal area and reassess all local sources of lake pollution. Under the state program, the surrounding regions of Irkutsk, Buryatia and Zabaikalye will be allocated 634 million rubles ($16.5 million) in 2014 alone. Buryatia will use its 289 million allocated rubles ($7.5 million) to build a sewage treatment plant in Kyakhta, on the Mongolian border, a sewer conduit in the village of Petropavlovsk, and a solid waste landfill in the village of Zaigrayevo. In the Irkutsk region, repairs on the sewage treatment plant on the Angara River will be undertaken and a sewer plant will be built in Shelekhov, near Irkutsk. Moreover, by 2020, there are plans to build six plants for industrial waste processing, which will help to rehabilitate about 80 percent of the contaminated areas. The results of environmental monitoring will be available on the website baikalake.ru.